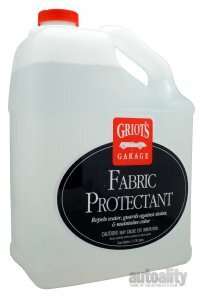 Griot's Garage Fabric Protectant, 128 oz. Versatile protectant safeguards numerous automotive materials including cloth convertible tops, carpet and upholstery. Durable hydrophobic qualities repel water. Maintains fabrics appearance with UV protection. Resists re-soiling, protecting against stains. Griot's Garage Fabric Protectant is the next level in stain protection and water repellency for all fabrics. The micro-bonding fluoropolymer formula is safe for all fabrics and will protect convertible tops and carpet from natural and man made elements. It will protect against oil- and water- based stains, guard against UV fade, maintain color, bead water and is extremely durable. Fabric Protectant will also resist re-soiling and its non-silicone formula will not attract dust or dirt if you put your car in storage. There are a lot of non-automotive uses for Fabric Protectant. It can be used on clothing, shoes, outdoor furniture, awnings as well as numerous RV and marine applications. Make sure the surface to be treated is clean and dry prior to application. Hold the bottle approximately 6 - 10 inches from the surface and mist Fabric Protectant in a light, uniform overlapping pattern. Immediately wipe away any overspray from paint, glass, chrome or interior surfaces with a clean dry microfiber towel. For maximum protection you may apply a second coat. Allow the surface to completely dry before application of the second coat. Once application is completed, optimal durability will be reached 24 hours after curing. Letting the surface dry in the sun will accelerate curing.